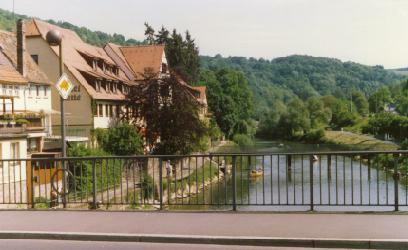 The Tauber is a small tributary of the Main River. 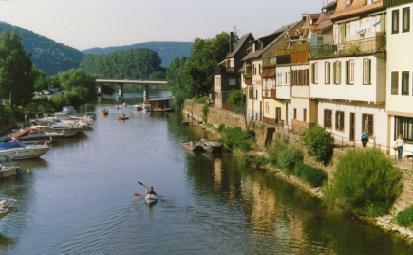 It flows northeast on the southwest side of downtown Wertheim. This bridge is for auto and pedestrian traffic; the smaller one in the distance is for pedestrians only. The boats are docked at the Wertheim Yacht Club. A canoe rental service is on the other side of the river near its mouth at the Main. The water level is controlled by dams on the Main, so the current here is slow and easy for canoeing. 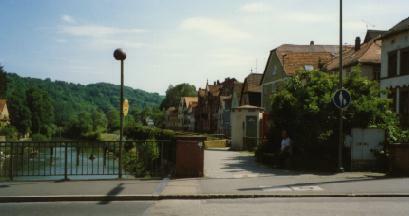 This is the view upstream from the auto bridge showing the left bank. 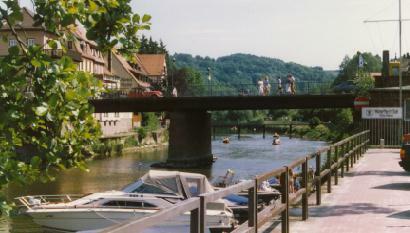 This is a view of the right bank. Further up the river, the right bank is more park-like. This is the view downstream from the auto bridge. The yacht club is on the left, cafes on the right, and the canoe rental is on the floating dock down near the causeway bridge leading west out of town.